To understand how to fillet fish there are two main topics to consider: fish anatomy and tools needed to get the job done. These topics will be thoroughly covered on this page. Filleting fish is an art form and takes practice. While initially it can be intimidating, don't think about it as being difficult. Take your time and don't be in a hurry, and develop a feel for the anatomy of a fish and you will quickly learn how to fillete fish efficiently. Click on the link above to view a sequence of pictures and descriptions to make this rewarding. FINALLY, a patented fillet board and clamp that securely holds slippery fish through the slimy fillet process in perfect fillet position. This means TWO WAY Fillet® provides you a safer, more efficient, and faster fillet process. Is TWO WAY Fillet® different? YES! Their clamp holds the head (not the tail) to fillet any species of fish. The more you clean the more benefit you will see. Using TWO WAY Fillet® is like filleting with a third hand. Find TWO WAY Fillet on their eCommerce store (www.filletboard.com, amazon.com and many Scheels stores. Link to amazon.com is below: Fillet A Better Way®. 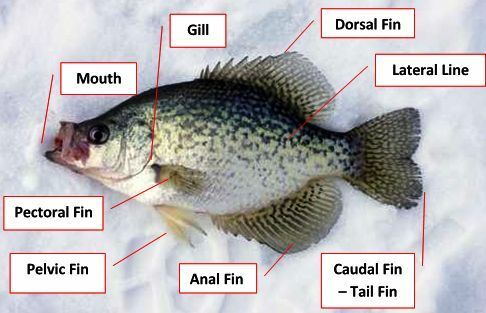 You don't have to memorize the names and take a test but at least understand basic Fish Anatomy if you plan to keep and fillet your fish for eating. The next picture will show you where you will want to cut away through the skin and meat up to but not through the entrails or guts of your fish. Your knife blade should go down but not through the back bone, rather turn and follow that back bone towards the tail. Your goal is to remove the edible portion (meat) without cutting into the entrails. 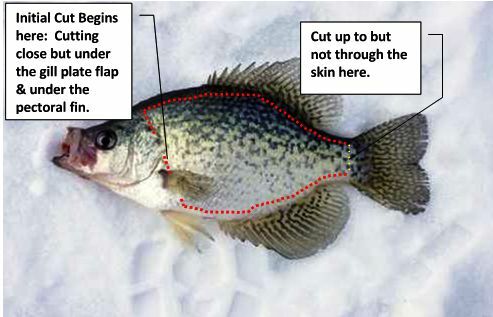 On the page link to filleting-fish above, you will see a series of pictures walking you through the process of filleting walleye and white bass. After removing fillets from both sides of the fish, you will need to remove the rib bones, rinse thoroughly with a clean water rinse. 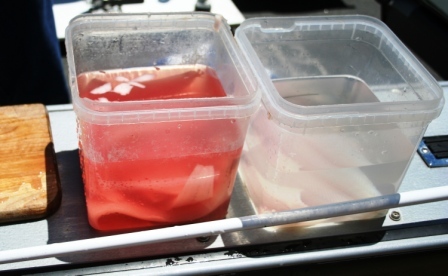 Note in the picture below the amount of excess blood and oil that is removed in the first rinse compared to the second rinse. 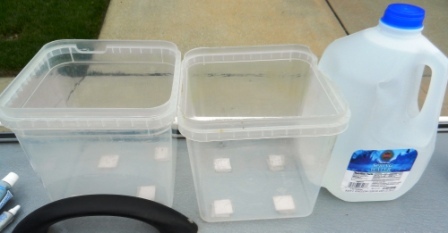 After thorough cleansing, for those fillets that you will not eat immediately, you will need to prepare them for freezing. There are several best practices you can review, including this Vacuum Sealing and Proper Freezing Techniques link above. The goal of freezing should be to prevent freezer burn and also pack your fillets in quantities that are easy to select for size of meals you typically prepare. Laying your fillets flat and not overlapping other fillets will enable you to vacuum seal them efficiently and also thaw them quickly and evenly when preparing them for a tasty meal. Don't overlook this step when learning how to fillet fish. Is this an Oxymoron? If you are going to eat fish, shouldn't it taste like fish? What most people associate with Fishy Taste is not the natural taste of the fish meat which is generally fresh, light and good. Rather it is a taste that is associated with how the fish smells when first caught. This results from the natural oils from the skin and can even be a result of excess oils from the stress of being caught. Northern Pike actually stink when caught and will slime up your hands, boat or clothes if rubbed against it. Click on this Fishy Taste link above link for practical tips to ensure you are able to serve the best tasting fillets possible. Avoiding fishy taste when you learn how to fillet fish will make you the perfect host!